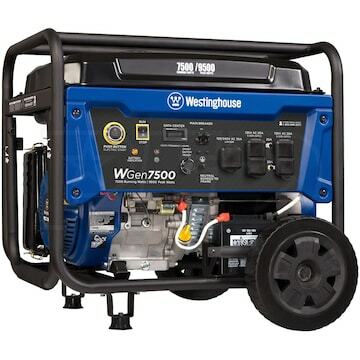 Unlike smaller camping generators, medium-sized emergency portable generators can simultaneously power multiple survival appliances, including your refrigerator, sump pump, and furnace fan. Most homeowners simply run the generator outside and string extension cords through an open door or window to the inside appliances. If you want to thrive instead of just survive, consider a large emergency portable generator (6,000-9,000 watts) instead. Yes, you can string extension cords from the generator. But, you won't be able to tap its full potential. Instead, large generators work best with manual transfer switches that can restore power in up to 10 circuits in your main electrical panel. In other words, they can energize multiple rooms in your home (minus a central air conditioner). If you want the strength of a home standby generator without the shackles of being tied down, get an X-Large portable emergency generator (10,000+ watts). These portable generator behemoths generate enough juice to keep your central air conditioner humming during a summer sweltering blackout. While an electric start is standard on most X-Large models, they are NOT automatic. Unfortunately, if you're not home, the electric start button won't press itself. For long-term outages, you will want a more permanent solution, such as a home standby or whole house generator. However, for shorter outages, Medium, Large, and Extra Large Generators should do the trick, depending on how much you want to power. NEXT: What Kind of Generator Do I Need for My Home? Emergency Portable Generator Buyer's Guide. Experts from Electric Generators Direct offer advice on how to buy an emergency storm generator and how to select the right sized emergency storm generator.